In today's crowded market, we're finding more and more that stand-alone games are ephemeral items, hitting store shelves and then vanishing from the public consciousness within a month or two. Of the thousands of new games published over the last few years, only a fraction have kept any long-term shelf presence. This is an industry-wide situation; many discussions with our fellow publishers often lead to "how do we best measure success these days?". 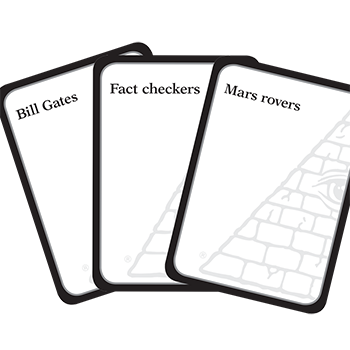 It was that current market attitude toward new games that led us to take our latest project, Conspiracy Theory, to Kickstarter. When the project launched last month, we had no idea of the level of demand. We had showed the game at a few places, including Gen Con, and players liked it, but we were left with the question: Should we publish this? The Conspiracy Theory Kickstarter project has funded, and even met a few stretch goals, but it was not a runaway success. This tells us to publish, yes, but only for direct sales. There's enough demand to print a profitable game, but perhaps not enough to reinvest that profit into inventory for distribution. Instead, we're going to fulfill our Kickstarter commitments and offer the remaining copies through Warehouse 23 and our Amazon storefront. Thank you to everyone who has supported us. You'll like the game! If you've not yet joined, the Kickstarter project closes later today, so there's still time, barely, to jump in. And retailers: We are making the game available direct from our warehouse to your store. Please contact us ASAP if you want to take advantage of our case special. Hurry. We're closing that promotion down this week. PS - Since the game will not go into distribution and there will almost certainly be no supplement published, I'm adding ten RED cards to the set. These open up a new mode of play. They were intended for later, but if there's not likely to be a "later," let's get them out there now and have fun with them.